Cool image time! In my routine monthly review of the hundreds of new images released from the high resolution camera on Mars Reconnaissance Orbiter (MRO), I came across another most intriguing geological feature, the image of which is posted to the right, after cropping. As the scale shows, the pit is about 300 feet across. Calculating the pit’s depth would require someone with better math skills than I. The website provides information about the sun angle, which can be used to extrapolate the shadows and then roughly calculate the depth. The most fascinating aspect of this pit is the impression of incredible thinness for the pit’s overhung edges. All of the pit’s edges appear significantly overhung, and the thickness of the overhang seems incredibly paper-thin. This thinness is likely only an illusion, though in Mars’s light gravity it is perfectly possible for the overhang to be far thinner and more extended than anything you would find on Earth. The image itself is in color, though the only color visible is within the pit itself. In that blueness at the base it seems to me that there is a pile of dust/debris, but once again, that conclusion should not be taken very seriously. If you take a look at the full image, what is impressive is the bland flatness of the surrounding terrain. There is no hint that there might be underground passages hidden here. While most of the scattered craters are probably impact craters, many (especially those with unsymmetrical shapes) could be collapse features indicating the presence of underground voids. None however is very deep. Nor is there any other pits visible. 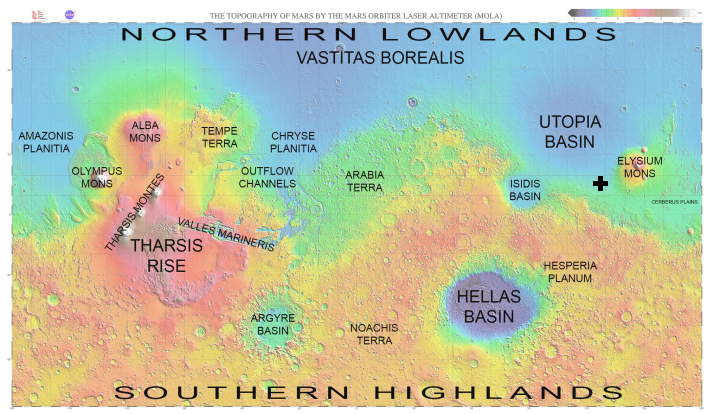 Below is a global map of Mars with the location of this pit indicated by a black cross. It is just on the edge of the transition zone between the lower northern plains and the southern highlands, where the shoreline of an intermittent sea is thought by some scientists to have once existed. 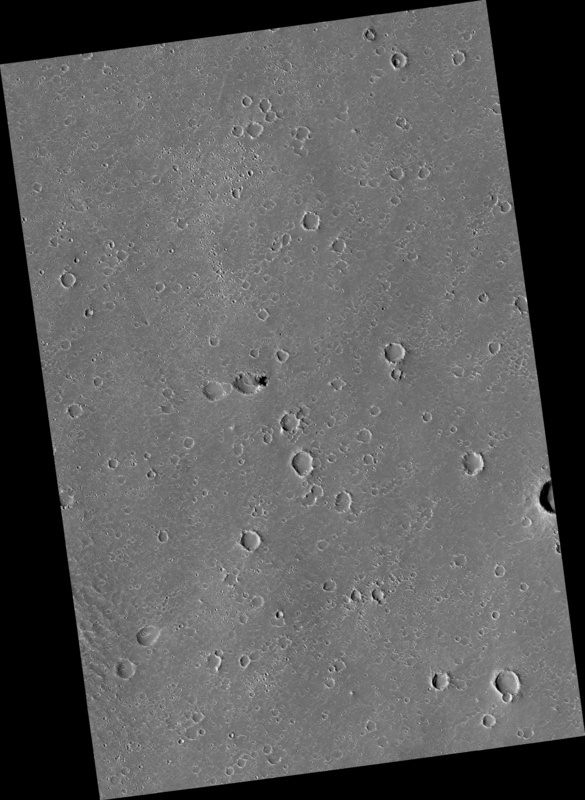 This is also an area where not a lot of high resolution images have been taken, mostly because of its apparent blandness as seen in previous imagery. This image demonstrates however that Mars is going to have interesting geology everywhere, and that we won’t really know it well until we have explored it all. Prospecting Mars is going to be a massive undertaking. We might have the technology to transport a colony their long before we know where a good place to build a colony is. The same is true for the Moon, we need a serious effort to prospect sites for lunar bases or use mobile bases. I’ll give it a shot. The article says that the sun was 37 degrees above the horizon. I estimated the length of the longest shadow to be about 80m, given the 100m guide line, and the sun from the lower right of the image. Then tan 37 = h/80, where h is the depth of the pit. Andi: Thank you. I think an estimate of 60 meters, about 200 feet, seems reasonable. Gosh, this would some wonderful rappel. Bob, Has it occurred to you that your spelunking skills make you an ideal colonization candidate? Lets set up a GoFundMe page – “Send Bob to Mars” ! @wodun, Yeah, I think that a couple of “flag and footprint” style missions would be the way to start out on Mars. There’s a lot to be learned before large scale sustainable missions can be made. It is very promising for prospecting that Mars2020 will carry a helicopter. A huge advantage for covering larger areas. 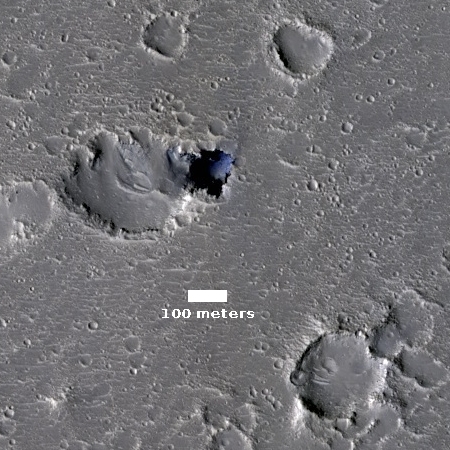 I don’t find the figure now, but I think that MRO has covered only something like 1% or 2% of Mars’ area with its high resolution (down to one foot), after 12 years. A liquid salt water lake has been detected under the southern polar cap, by radar on Mars Express! 20 km wide but the depth is not better known than “at least 1 meter”, since liquid water absorbs the radar waves. But it is a real lake, not just “slush”. So while it might be useful someday, accessing, analyzing and purifying it will be beyond our capability for what appears to be a good long while until we can set up some fairly large machinery. @Col Beausabre I understand that it is clear water, not just humidity. That can certainly be determined with radar. And brine it is for sure, it is liquid at an estimated temperature of minus 10 Celsius. It is of course not useful as a resource, there’s plenty of water much more accessible. But if there ever was life on Mars, it might have retreated to lakes like this. But I suppose it would require contact with bedrock to have any nutritions of substance, not embedded in ice. It might be doable to melt down a probe to it. That’s a technique in high demand among astrobiologists for the Jovian moons. I’ve been trying to imagine what a mobile base would look like and how it would get to the Martian surface. Maybe the BFR/BFS will solve part of this problem. 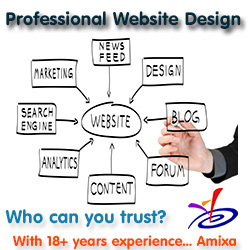 A base that could be moved would prevent a lot of money wasted on something that would otherwise only be used once. A wagon train of sorts would allow for some intensive prospecting over long periods of time. They could even develop ISRU skills in making garages along the way to protect from dust storms and radiation. @wodun It is being worked on! A mobile habitat is a great idea. It doesn’t need to move fast in order to cover a large area during the long stay between conjunctions. Wernher von Braun wrote “Das Marsprojekt” which was the first serious description of a human trip to Mars. His vision was to land with gliders on the ice of a pole and then move on the ground towards the equator to build a landing strip for further space ships.